Build better Christian stewards with our year–round program! One of the primary responsibilities of any church is to inspire Christian stewardship. Our year–round stewardship program addresses this challenge in an effective, consistent and low–key manner without putting the burden on the pastor. The dilemma: How do you instruct your people about the scriptural truths of giving and sharing, without making it yet another job for the pastor or without pressuring people? Led by the laity, our programs provide all of the resources necessary to teach and train would–be stewards the scriptural truths about Christian giving and transform them into life–long stewards! People are not familiar with what God’s Word says about money, material possessions and giving. People have never been trained to make giving to God a priority; they give what is left over at the end of the month instead of giving “first–fruits” offerings. People of all ages who fail to recognize that God owns it all! Sacrificial givers who comprise the financial backbone of most churches are slowly passing away without being replaced. The Inspiring Stewardship program is based on God’s Word and works in any church to address these challenges! The program has benefited thousands of churches of all sizes in the US and Canada. This program, which can beled by the laity, is not another job for the pastor. Nor is it just a short–term “fund–raising” endeavor. Rather, it is a year–round educational and training program designed to inspire people to be life–long stewards. It consists of 48 principles concerning money, material possessions and giving. These principles are closely coordinated with Scripture and are used in a variety of systematic presentations. 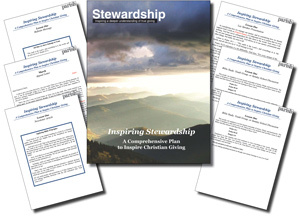 Every month, all of the resources necessary to run the Inspiring Stewardship program are downloadable from your account at The Parish Resource Center on our website (in both MS Word and PDF formats) one month prior to the month they are used and remain there for the month in which the resources are used. Keep in mind that more than one person may have the log–in information to your online account. All materials are designed to be used “as–is,” but can easily be edited to fit specific needs. The Bulletin “box,” which appears in the bulletin each Sunday for one month. “Applying Bible Principles” is the newsletter article that is published once during the month. This can also be used as a bulletin insert or attached to an email. The Lay Speaker Presentation is given once a month by a lay speaker, usually right before the offering. We suggest this take place on the third Sunday of the month since relatively few holidays occur on that Sunday. The lay speaker can put this material into his or her own words; however, most read it for maximum effectiveness. All of these presentations are designed to last about three or four minutes. The Bible Study or Your Group Discussion is for Bible study groups, youth groups and Sunday school classes. Younger children are asked to discuss the questions with their parents or guardians; adults and older teens are requested to discuss them with their families. It takes about five minutes to use once each month. Offering Appeal Letters. Three offering appeal letters for Easter, Thanksgiving and Christmas are included. Thank–You Letters. Four thank–you letters each year are included to accompany quarterly donor statements. All campaign resources are easily editable, if desired. The campaign brochure and response card requires you to insert the church name and then are ready to print. When the Commitment Campaign materials are used, they are used in lieu of one month of the regular program. Thus, the Commitment Campaign is inserted in between two regular program months (you don’t skip that regular monthly lesson, but instead do it in the month following the Commitment Campaign). In most situations, the pastor’s role is to review the materials. The key person in utilizing the program is a Lay Coordinator. He or she is responsible to contact individuals for the Lay Speaker Presentations. In addition, the person responsible for the bulletin (and newsletter) will include the bulletin box each week and article once a month. Thus, this program does not constitute another job for the pastor unless the pastor desires “hands on” involvement. Choose from three different emphases! Giving of Time, Talent and Treasure This emphasis is broader and helps people see that their time is an invaluable addition to Christian giving, as well as help them discover that their many talents can be valuable to others. Giving of Treasure This is popular for churches that want to address their most acute problem: financing the Lord’s work. Its lessons are presented in a peer–to–peer, laid–back manner by lay people. Giving of Time and Talent When money isn’t the issue, then your emphasis may be to empower people to better share the gifts that God has given them. When ordering, we also offer an alternative translation of the Scripture references. The NIV Bible is the default, but you can also choose Inspiring Stewardship that uses the NRSV Bible translation. Need more information? Click to download overview and sample packet.